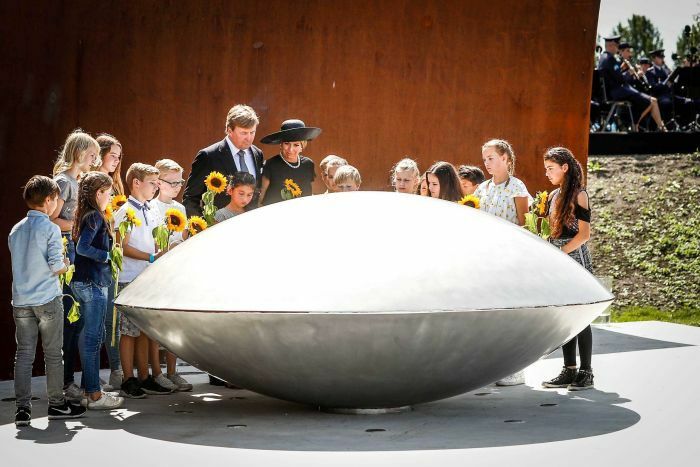 VIJFHUIZEN, Netherlands -- The Netherlands unveiled a national monument on Monday in memory of the 298 people killed in the downing of a Malaysia Airlines jetliner in 2014 above territory controlled by pro-Russian separatists in eastern Ukraine. King Willem-Alexander and Queen Maxima unveil a monument inscribed with the victims' names. Victims came from 17 countries, and included 196 Dutch citizens. The Netherlands took the lead in investigating the crash and intends to try those it considers responsible. Authorities concluded the plane was shot down by a Russian-made ground-to-air rocket but have yet to formally identify suspects. Moscow denies any of its rockets could have been used. On the third anniversary of the disaster, King Willem-Alexander, Queen Maxima and caretaker Prime Minister Mark Rutte unveiled the 25-metre-long monument in a park in the village of Vijfhuizen, near Amsterdam's Schiphol airport. Dutch politicians and around 2,000 relatives also attended. A glistening steel structure shaped like an eye and set before a dark wall bears the names of the victims. "If you look into it, you will see yourself and the name of your loved one," Ronald Westerhuis, the sculptor who designed the memorial, was cited as saying in the Trouw newspaper on Monday. "The steel is so polished it will reflect the sunlight onto the dark wall, in the hope that this will ease the sadness."